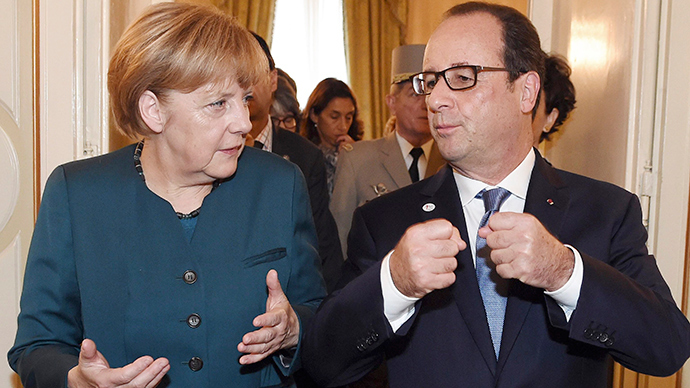 "Together with Angela Merkel we have decided to take a new initiative," Hollande told a news conference. "We will make a new proposal to solve the conflict which will be based on Ukraine's territorial integrity." “Along with Angela Merkel we thought we have certain responsibilities: Germany because it has strong economic relations with Eastern Europe, it has ties with Ukraine and Russia; Why France? Because France has historic, cultural, human, political and also economic links with Russia,” he stressed. The two European leaders decided Wednesday night on the trip and did not consult American officials about it, AP reports citing a senior French official. "In view of the escalating violence in recent days, the chancellor and President Hollande are intensifying their efforts, which have been going on for months, for a peaceful settlement to the conflict in eastern Ukraine," Merkel's spokesman Steffen Seibert said in a statement. According to Hollande, the joint initiative of France and Germany is aimed at producing a text “acceptable to all,” as"diplomacy can't go on forever." The French president also said that France is not in favor of Ukraine joining NATO. President Vladimir Putin is ready to hold constructive talks with Hollande and Merkel, said the Russian leader's senior foreign policy adviser, Yuri Ushakov, calling the upcoming meeting “a positive step.” He added that Kremlin hoped that the leaders of France and Germany would consider measures recently proposed by Putin. “We are ready to hold a constructive discussion, with a view to reaching any agreements that would encourage a general stabilization of the situation, establishment of direct contacts between official representatives of Kiev and Donbass,” Ushakov told reporters. US Secretary of State John Kerry also arrived in Kiev on Thursday for a meeting with Petro Poroshenko. It follows Washington’s consideration of supplying Ukrainian army with weapons. Political analyst Aleksandar Pavic believes that the US is really in charge of this game.“So maybe privately the European leaders are against this, but so far they haven't shown sufficient resistance to Washington. In fact they've shown that they're not an independent entity as far as foreign policy is concerned,” he told RT. But according to geopolitical analyst Martin McCauleyHollande and Merkel don’t want the US to escalate the conflict in eastern Ukraine as "the Americans are talking about the possibility of providing anti-tank weapons, drones, radio communications and so on – lethal weapons, after all, which would exacerbate tensions there." The situation in eastern Ukraine escalated in January, with shooting and shelling in the Donetsk area - the main stronghold of the anti-Kiev forces - resumed on a daily basis, claiming lives of civilians. Last Saturday, peace talks in Minsk ended with no breakthrough and resulted in a blame game between Kiev officials and the rebels.